Multi-element analysis by ICP-OES or ICP-MS is a powerful technique which is very popular in a wide range of laboratories including those analysing minerals, metals, pharmaceuticals, chemicals, food, blood and urine as well as used oils, water and soils. While these instruments offer speed, convenience, specificity and sensitivity in a routine setting, analysing samples with a wide range of concentrations can still produce a high % of samples that fail their first analysis. This is because the concentration is above the instrument method’s dynamic (calibration) range and so they must be diluted and run again to get a reliable result. Even with modern instruments with autosamplers this analysis failure is then compounded with the tedium of manually processing the failed samples. This typically includes working out which samples failed, removing them from the instrument autosampler, calculating a suitable dilution factor, carrying out the dilution and returning the diluted samples to the autosampler for a second analysis run. To help address the challenge of these over range samples, in some cases contributing to 25% of all analysis runs, CSols have developed the AutoDil software application. AutoDil is part of the Teledyne CETAC High Performance Liquid Dilution System (HPLD) and together with a powerful autosampler, dilution system and different ICP instruments is able to fully automate the dilution of those samples that fail their first analysis. 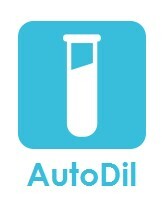 AutoDil uniquely uses the results it reads from the ICP instrument to decide which samples need diluting. The results are first compared with the upper detection limit for each analyte, usually read directly from the instrument software method. AutoDil will then either dynamically calculate the dilution factor or will use one or more preset fixed factors. Once dilution factors for all analytes are ready, AutoDil creates a new instrument run with revised read and wash delays, and in combination with autosampler/dilutor control sequences, immediately takes full control of the High Performance Liquid Dilution system. As AutoDil knows where the over range samples are located on the autosampler and the amount and number of sample aliquots to take, there is no need for an analyst to intervene. This not only saves valuable analyst time but means overnight instrument runs will be completed ready for further runs in the morning. superior to manual dispensing and can reliably provide up to a 200 times dilution factor with a single dilution step. Once the Repeat Run is completed, AutoDil merges the original and diluted results, applies the dilution factors and displays them for review. In the event that the method uses sample weights or if samples are made up to preset volumes and different units are used, AutoDil will display the results correctly. The final results may be printed or saved in a file format for transfer to LIMS. AutoDil in combination with the Teledyne CETAC HPLD system provides a powerful automated instrument dilution system. Substantial time, quality and productivity savings are possible so that the choice of a HPLD system will provide a rapid return in investment for your laboratory.